American University’s Kogod School of Business announced today the release of the 2016 Kogod Made in America Auto Index that provides consumers with a more accurate picture of the production process for the most popular vehicles on the road today. The Buick Enclave, Chevrolet Traverse, and GMC Acadia rank as the most American-made 2016 car models, according to the Index, developed by Kogod Professor Frank DuBois, an expert in global supply chain management. Canadian and U.S. content are not disaggregated. Automakers can “round up” individual parts content from 70 to 100 percent to calculate domestic content. supply stores, and car dealerships. 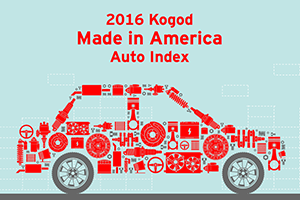 To view the complete 2016 Kogod Made in America Auto Index, visit http://kogod.biz/2016autoindex.See http://www.american.edu/kogod/autoindex/index.cfm to view and compare the 2015, 2014 and 2013 Kogod Made in America Auto Index.